Nick Warren is our special guest at Culture Box in Copenhagen on Saturday 17th May. Our label boss Tim Andresen got hold of him for a short but interesting interview. Hi Nick. Hope you’re well and thanks for taking the time out to talk to us. Just to sum it up for the youngest fans out there who may not have followed your entire career… You were the tour DJ with Massive Attack and later became resident DJ at the super club Cream. That led on to playing everywhere across the planet and one of the longest and most impressive careers of any DJ in history. You’re making music under your own name as well as part of the Way Out West duo with several albums under the belt. You run a radio show and a label (Hope Recordings) while continuing to tour week in and week out. Where do you get your drive from? I love what I do and still have a huge desire to make and find electronic music, its an addiction I suppose For my own music and for Way Out West I suppose I feel there is still better to come which pushes me to make more music and try to get it better and better. For the DJing side I feel I am playing the best music of my life, taking a deeper route than in the past has been inspiring and for my radio shows it is a pleasure to try to promote other peoples amazing music. We recently discovered by word of mouth that you and Jody are back in the studio and working on new Way Out West material. That is exciting news. What can we expect? We’re really happy with the way our new tracks are sounding and I will no doubt be playing some of the new material in Copenhagen. With my strong ties to Scandinavia I have found a couple of great vocalists to work with and the ideas Jody and I have now are very current. The album will hopefully be finished by the end of the summer! Please describe for us how you guys work together? We are both writing separately and sending each other tracks to work on. Then from around 2 months ago we have been working every day in the studio together crafting those ideas. Obviously both of us also touring constantly means things take a while. On top of your Way Out West project you have also done solo tracks like “La Fabrica”, “Devil’s Elbow” and “Buenos Aires” recently. Any other solo stuff in the pipeline we should know about? With the new Way Out West album on the way I decided not to release any solo material for a while so I can concentrate on WOW fully but there is a remix I am doing of an Icelandic guy named Asgeir, he has a great voice. Please tell us a bit about The Soundgarden album? In the past you have done 8 critically acclaimed albums for Global Underground and some for Balance and Renaissance. 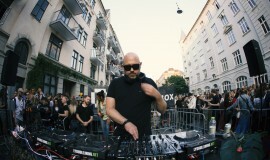 Most of them being made in what we call the glory days of clubbing and some of them are by many described as milestones in the history of club music. How do you see the difference between the past and today and do you still see a bright future for club music as we know it today? Thank you. I think there is 2 sides to the electronic scene right now, the very commercial EDM style what I call “Confetti DJ’s” and the more serious music-led DJ’s. Back in the day a record, for instance “Age Of Love” would be played by pretty much every dj out there, that doesn’t happen any more, a lot of DJ’s are unwilling to step out of their perceived genre. Personally I find the DJ’s that play amazing music across all genres the most interesting. You have been touring a lot recently including a B2B tour with Hernan Cattaneo. Please tell us a bit more about your DJing relationship with him? Hernan and I play very very well together we have a musical understanding that is a rare thing while playing B2B. Even though we can be playing really different sounds it just always clicks, and he is a great friend. We noticed you have done a fair share of boat parties lately including Melbourne and Miami. What do you prefer the most – day time boat parties or late night club parties and why? Hahaha yeah all the boat parties in Miami, Melbourne and Sydney have been great, playing music for hours and still getting to bed before midnight has been excellent. But to be honest a mixture of the two throughout the year is best. It is your second time at Culture Box in Copenhagen. Due to the size of the club, I guess it’s different to the majority of the other gigs you play. How was the first visit and what can we expect this time? I loved the place and you do a great warm up Tim so it makes life for us guest DJ’s easier. I think it is a room that lends itself to groovy and interesting music so I will be following my deep but chunky route I love right now! Is there still a place you dream about where you haven’t been playing yet? Through pledgemusic.com some lucky people can now get you to DJ at their house party or even go fishing with you? How did that idea come up? We just wanted to give the fans something unusual and different with the upcoming Soundgarden album, it has proved really popular but there are a few things still available so go to http://www.pledgemusic.com/projects/nickwarrensoundgarden and get involved! Just like many other DJs, we know you’re a foodie. What would be a proper meal for you? I love wild food, especially game and fish, I think to forage your own food and cook it yourself is something very special. Denmark has some very wonderful restaurants which I love to visit. We went to Relae last time and ate Christian Puglisi’s food and it was incredible. What do you love and hate the most about your job? Any secrets about Nick Warren you still haven’t told us about? I have never caught a fish in Denmark and that frankly has to change. Many thanks Nick. See you at Culture Box on Saturday 17th May.